parklet: a small urban park, created by replacing on-street parking spaces with a patio, planters, trees, public seating & bicycle parking. Parklets provide a public place for people to escape the hectic pace and clutter of city sidwalks and streets and enjoy the atmosphere of the city around them. Andersonville takes great pride in its efforts to promote sustainability, but we lack one fundamental element of a truly sustainable community: sufficient green and open space. Now, you have an opportunity to help change that. As part of a greater eco-Andersonville initiative to improve pedestrian accessibility and bike infrastructure throughout Andersonville, the Andersonville Development Corporation (ADC) has partnered with the Chicago Department of Transporation (CDOT) and local business owners to build one of Chicago's very first "Parklets". Utilizing native plants, public seating and bike parking we will create a green urban retreat in one of the densest commercial districts outside of the loop. Many other major cities across the US are already embracing the parklet approach. This space is an opportunity to re-imagine our urban environment in a way that fosters community. Help foster a sense of community and bring green and open space to Andersonville by supporting our mission to build Chicago's first parklet! Understanding that it could take years to get a full-scale park or public space project in Andersonville, we want to do something NOW to make our stretch of Clark Street just a little bit greener. 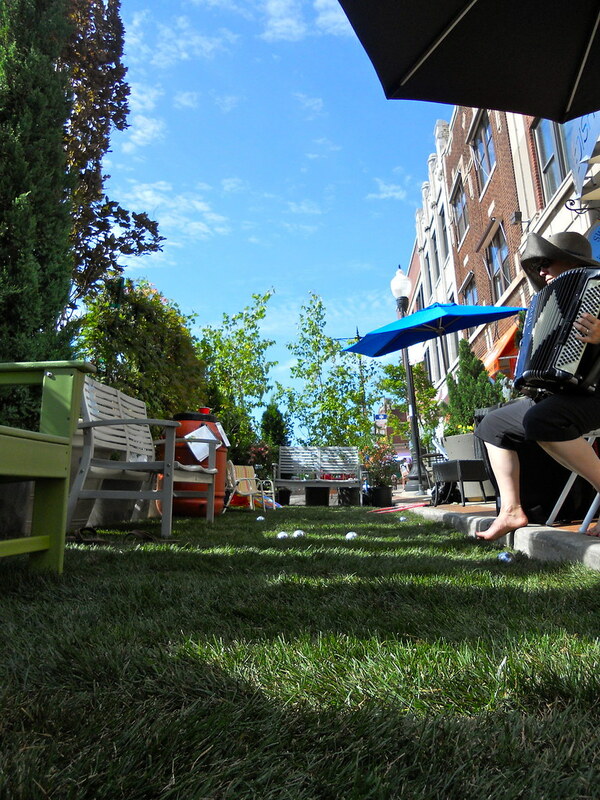 Last year during our Green Week activities we placed a pop-up green space on Clark Street. It was a huge success, drawing artists, musicians, families and friends to gather for games and entertainment all day long. 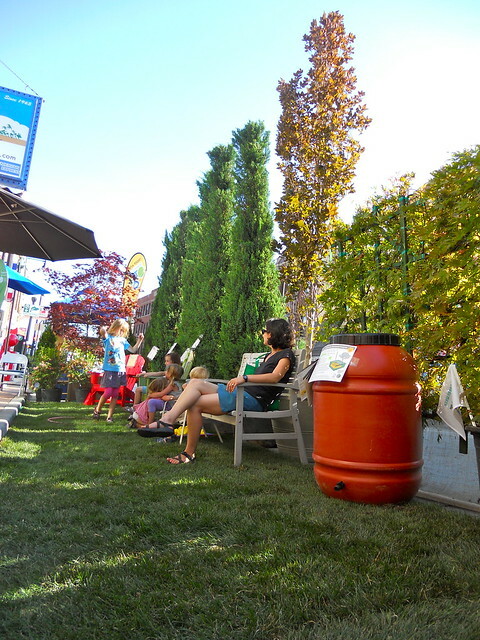 We knew then that this pop-up parklet had the potential to be a permanent fixture in our community. Since that time, eco-Andersonville has exhaustively researched parklets, their impact on the communities they serve and what it takes to build one. We are now 100% prepared to take on the challenge of placing a parklet on Clark Street. We have support from the City and an ordinance awaiting passage in the City Council. The very last piece of this parklet puzzle is that extra infusion of cash to make the purchase of materials possible. ADC already has measures in place to fund approximately 50% of the project. We anticipate costs between $10,000 and $14,000 in year one. To complete this project, we are asking for support to raise $5,600. Additional funds raised will be used to maintain the parklet with seasonal plantings as well as fund our future goal to build parklets in three locations throughout Andersonville. The Andersonville Development Corporation works to move our community toward a future that is environmentally, economically and socially sustainable. Our evolving eco-Andersonville initiatives are a core part of this effort, including the Sustainable Business Certification and Andersonville Green Week. These programs would not be successful without the incredible businesses, organizations, and residents of our community that support them. Thanks for thinking of us! You are so special we want to give you a shout out on our Facebook page. Hey, thanks a lot for helping us out! How about we send you some eco-Aville swag to say thanks. A neat new button will be coming your way. Wow, you're a real pal! Carrying all that awesome around must weigh you down. We'll make sure to send you a custom made canvas Andersonville tote bag to ease the load. For fun we'll stick a button on it too! You are so sweet! That's why we want to give you one (1) ticket to the Andersonville Dessert Crawl! Enjoy that tasty treat in the Andersonville parklet and pat yourself on the back for being such an amazing backer. We'll also throw-in a Silver Level sponsorship recognition so everyone knows it. Plus, a tote and button. Oh, you shouldn't have! We definitely want to do something extra special to say thanks. How about memorializing your contribution on a dedication plaque with other donors and adding you as a Gold Level sponsor on our website. Plus a tote, button and Dessert Crawl ticket. We just can't thank you enough for sharing all the love. Since you are now our new best friend for life, let's do lunch. The eco-Andersonville staff will personally treat you to a special local lunch at the parklet (up to two guests). Obviously, for a Platinum Level sponsor like you this type of service is well-deserved - we will make sure to recognize your contribution on an exclusive plaque at the parklet. Plus, an organic seed packet, a button and Dessert Crawl ticket.